Something is out of place when Triss wakes up. Her parents say there was an accident, that rest and a trip to the doctor should settle everything down; but Triss cannot believe it. Not only have dolls begun to shriek in her presence, and leaves cling to her hair in the morning, there are holes in her memory, her younger sister refuses to be with her, and her parents won't stop whispering secrets to each other. Nobody will tell her what is wrong. Triss begins to fear the worst. But this time she won't sit idly by and do no more than rest. This time, she will discover what's amiss and put it right. 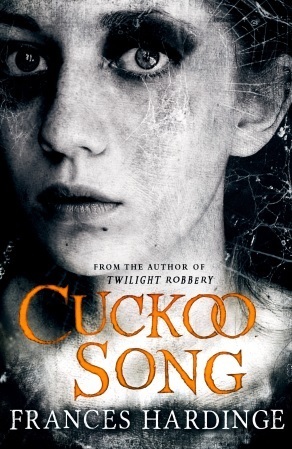 Let me begin by saying that Cuckoo Song is one of the best books I have read this year. It is eerie and touching, a fairy tale of its own right and a book that never quite leaves you when you close it for the night. The story is set between the two World Wars, when jazz was finding its way into Britain and a woman working was met with head shakes and disapproving eyes. It is an atmosphere Hardinge seamlessly wove into her tale, reminiscent of Gaiman, classic fairy tales and folk stories all at once. In Hardinge's hands, such mundane things as the telephone, watches, the cinema and the tram are magical. After all, the world may be turning, but magic has been part of the land for long enough to evolve with it. The worldbuilding is unravelled at a measured pace, for the reader steps into this wondrously frightening world alongside Triss. And how easily this is done! Hardinge's prose is nothing short on beautiful and haunting. From the various descriptions of jazz to those of Triss's fears coming true, the writer beckons us into this world with an irresistible allure, and once we're inside, the door shuts quietly behind us and we cannot leave. Of course that story and characters help as well. Though grey is a prominent colour in the book (and for good reason, for nothing here is quite black and white), there is a panoply of colour and form to the populace in Cuckoo Song. It is the whole cast who drives the story forward, with nobody forgotten, left behind or turned into a two dimensional character. What's more, the heroes in this story are the villains, the monsters in many others, a small, heart-warming twist. The relationships between the characters too are organic and ever moving, both when it comes to speed and feeling. That between Triss and two other characters (whom I will not name as one was a surprise, but surely others who read the book will know whom I refer to) is particularly heart-wrenching. I recommend this book to people of all ages and backgrounds. If you're the sort who does not read Middle Grade for fear of it being childish, please don't let that keep you from reading this. Cuckoo Song is a deeply moving, multi layered book about finding oneself, where magic and the aftermath of World War I walk hand in hand. "Let me tell you - from one monster to another - that just because somebody tells you you’re a monster, it doesn’t mean you are."